In 2014, Ryanair CEO Michael O'Leary landed at Dublin airport with the first of Ryanair's new Boeing 737-800 NG aircraft from Seattle. The aircraft has become a staple for Irish travellers. Irish-based pilots have voted to strike in what Ryanair says is an 'unnecessary' action. Here's an explainer to get you up to speed. 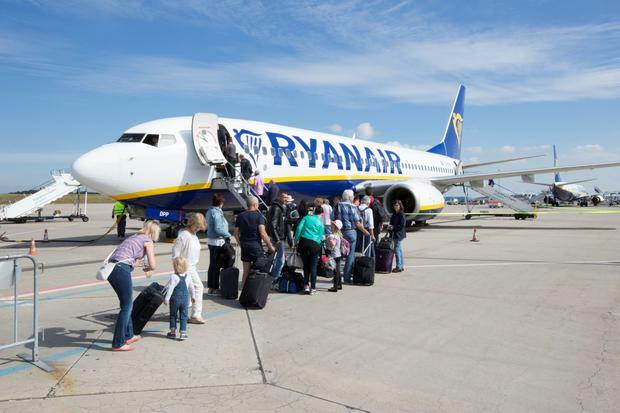 Thousands of Ryanair passengers face the prospect of travel chaos after pilots served notice of a 24-hour stoppage for Thursday, July 12. The notice was served by the Irish Airline Pilots' Association (IALPA), almost 100 of whose Irish-based pilot members voted in favour of industrial action. The striking pilots want those with the longest service to get first call on entitlements and workplace benefits like annual leave when their children are on holiday, promotions and transfers between bases. When will the strike happen? IALPA is a division of union group Fórsa, which said the strike action will last for 24 hours beginning at 1am on Thursday, July 12. No. Industrial disputes can involve a lot of threats and bluster. The strikes have been called, but Ryanair and IALPA are likely to negotiate, so there remains a possibility that action may be averted before July 12. Fórsa said it is “willing to engage” on the issues. Will my flight be affected? Nobody knows what flights are threatened right now. Ryanair says next week's strike could affect just 7pc of its flights, but obviously, that's little reassurance to anyone booked to fly to/from Ireland on July 12. If negotiations fail, Ryanair says it will communicate next Tuesday with all customers travelling from Ireland on July 12 - the day of the "unnecessary" strike - by email and SMS text message. What are my rights if my flight is cancelled? 1) Re-routing as soon as possible, subject to availability, free of charge. 2) Re-routing at a later date. Read more: What are my rights if my flights are cancelled? How do I arrange a re-routing or refund? The quickest option is to check your carrier's website. It should include the steps to process your own refunds or bookings. I don't want to lose my holiday. Should I act now or wait? That's the dilemma, and the reason this is so frustrating for passengers. Unfortunately, nobody can say for sure. As it stands, no flights have been definitively cancelled, so passenger rights do not kick in. If you have booked a holiday through a travel agent, keep in touch with them on this - ITAA members will work on your behalf to smooth disruption. If my flight is cancelled, can I claim compensation? Financial compensation depends on the flight length and the reason for the cancellation. It generally ranges from €250 (short-haul, less than 1,500km) to €600 (long-haul, over 3,500km). Several scenarios can impact on compensation rights, including the notice given (see a full breakdown of compensation rights here), and whether or not it is due to extraordinary circumstances - which arguably, could include a strike. Generally, compensation claims are evaluated on a case-by-case basis - so if you believe you have a strong one, go ahead and make it. For more on your passenger rights, call 01 661-1700 or visit flightrights.ie. What if I am overseas? Am I entitled to care and assistance? If your flight is cancelled and you choose to be re-routed as soon as possible, then you are entitled to meals and refreshments, hotel accommodation and transfers between the airport and hotel as required. If the airline does not provide these, and you end up paying yourself, keep the receipts - you are entitled to a reimbursement of reasonable expenses. NB. A five-star hotel may not be a reasonable expense! Bear in mind that if your flight is cancelled and you choose a full refund, then the airline's obligations to you end there and then. Can my travel insurance help? In the event of a flight cancellation, the first source of refunds and re-routing should be with your airline (see above). Standard travel insurance policies don't offer much help here (and many have specific exclusions for industrial action), but 'missed departure' cover can help you secure a new flight, or an additional night's accomodation. If your policy includes extra "travel disruption" cover, you should be covered for additional transport or accommodation costs up to around €1,000pp - this covers most scenarios with flight cancellations due to weather, strikes and so on, but not lost annual leave, business opportunities or attraction fees booked in advance online. Travel Disruption cover can be added retrospectively to a policy, but not to claim on an event that has already happened (or been forecast). That's also unknown. Fórsa said it has told Ryanair that it will notify the airline of additional strike days “in due course”. However, it also says it is willing to negotiate. Other groups of staff - cabin crew, for example - are also set to demand better conditions, while there are fears that industrial action will hit bases abroad. The strike warning follows a wave of French Air Traffic Controller strikes, and travel disruption experienced by CityJet passengers this week.